Preheat oven to 400 degrees. Line a baking sheet with parchment paper. Place the butternut squash, cut-side-up, on the baking sheet and roast for 30 to 40 minutes. 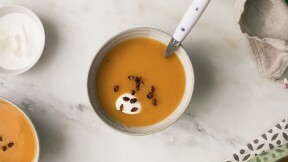 Scoop out butternut squash flesh and transfer to a blender along with 2 1/2 cups of broth. Blend until smooth, adding more broth if needed. Pour the soup into a pot, set over medium heat. Mix in the spices and bring to a gentle simmer for 10 minutes. Divide amongst bowls and top with sour cream or yogurt, nuts or dried fruit.